Left school in 1964 at the age of 16 and worked as a clerk for the now defunct Middlesex County Council - in fact when I got the job they explained that it was going to split into London Boroughs the following year. Two great things about this job. 1.) The office was located at the Middlesex Guildhall which is on Parliament Square, so worked in a great part of London. 2.) Women/girls worked there and after the all-boys school of Barnsbury it was all a bit scary! The older girls used to tease me and make me blush!!! Anyway, ended up with a great girlfriend there who introduced me to the world of art and books. The only thing I had been interested in up to this point was Arsenal! I was moved to Tottenham Town Hall (of all places) on the introduction of the London Boroughs in 1965 working for the London Borough of Haringey. Bored silly doing nothing so I joined the NCR in Baker street. It's easy to forget in those days there were pages and pages of job adverts every night in the Evening Standard. Got bored there too, but at least I was busy. Decided that life must be better than this and joined the RAF. Boy, did I mature there! Spent a year in the Maldives (RAF Gan) played lots of football and cricket.......Signed on for 5 years as Air Traffic Control Assistant. Did this in civvy street on release and worked at the London Air Traffic Control centre at West Drayton, but as I did not have any "A" levels I was never going to progress to be a controller. However, the money was very good even as an Assistant. Once again I thought life has to be better than this and resigned to "do" the Hippy trail to India. So caught a coach from Totteridge tube station to Kathmandu for the sum of £99 in 1975. Met my soon to be wife and came home and got a job at Freightliners Ltd (containers on rail) in Leeds. My wife Janet is from Yorkshire so we settled up there on return from India and Nepal. Progressed from humble clerk to manager of their busiest Terminal at Felixstowe - a family to provide for makes you work harder!!!! Now retired on a great pension with free rail travel and think I am a very lucky man! (Ed: what a fabulous line, "caught a coach from Totteridge tube station to Kathmandu". Left Barnsbury with just one GCE, Maths, grade 4. So not in same class as many of you with a few passes. That exam got me an apprenticeship with HMSO, but unfortunately at Harrow and Wealdstone. Pay for first year was about £2.50 per week. So what with fares I did not have a lot to spend. Had to travel from Old Street to Highbury then get another train to Harrow. Luckily during my second year my parents helped me buy a Lambretta tv 175 slimstyle, although I only had it three days when I went sliding along Upper Street on its side. Pulled up with front brake first before applying back brake so you can imagine result. Managed to do a lot of repairs at work as I was a trainee engineer. After 4 years moved to London depot where I stayed as night engineer till about 1980; there we printed the Hansard. Then they decided to change to new processes which would have meant my type of engineering would disappear; I was dealing with hot metal machines. I decided to move to News International, yes, the Sun and the News of the World. Was only there for about five years when we were made redundant. And yes, I was involved in the famous Wapping dispute, on picket lines and on the marches. After this I went into business on my own, greengrocers. That lasted two years and you might have noticed lately, there are not too many greengrocers around these days. Destroyed by supermarkets. From here I worked as a courier driving all over the country, nice job for about 10 years till I realised I was falling asleep at the wheel sometimes, so stopped. Was working about eighteen hours a day. From there moved to W. H. Smith, delivering magazines until made redundant, then finished my days at Moss Bros driving, a badly paid, but regular job. Had a varied career, but glad I am now retired. Like reading your chats about Holloway and area, as unfortunately I never really went in there due to living in depths of Finsbury. Used the area more when I moved with wife to Hornsey Road, very near to fire station. From there it was nice to support the best club.. ARSENAL. Like a lot of us ‘olloway boys of ’63, I left school with a Handshake from The Bonk wishing me well, and very little else except a wonder for the world and what was to come next. My dad (God rest Him) was a signwriter, and was employed in a little workshop at Clerkenwell Green. He took me to work with him to enable me to become a signwriter. Sadly my handwriting was rubbish, and after just a couple of weeks was transferred to the carpentry shop where I was instructed how to construct the sign boards. Having been schooled by Mr Rooke in how to make a half lap right angle joint I thought my chances were good, however my foreman insisted that the right angles should be 90 degrees, as opposed to mine which were in a range from 88 to 92 degrees. I didn’t really see the difference, surely the signwriting guys could just lean one way or another to make the text straight but no, I was not good enough to make the boards, so was put to work sweeping up. This turned out to be a godsend, for as I discovered a carpentry workshop was a perfect place to collect firewood. Over the next few months I stored as much firewood as I could, taking it home in little bundles, all wrapped up in yesterday's ‘Evening News’ on the 19 bus and stored in my small LCC flat bedroom. The winter was coming on and so I started a little round on my (Freddie Grubb) bike on a Saturday, selling bundles of firewood to all the old biddies on our estate. All the flats on The Quadrant had coal/coke fires with back boilers, so everybody needed firewood. Then it occurred to me that the Harvey’s ‘Cleanglow’ depot in Drayton Park was just a stone's throw from where I lived in the Quadrant, so I went and introduced myself to Mr Harvey (Len to his friends), and proposed that I could ride with his lorries selling firewood to his customers, and to pay my way, would sweep out the back of the lorry at the end of the day and do general duties around the yard. Of course this level of output could not be sustained by the small amount of wood I could nick in my other job, so I went to see Mr Anderson (Terry to his friends) at Islington Green, to see if I could buy any spare off-cuts that they had left over at the end of each days woodcutting. I was informed that this was already catered for, and was called ‘dunnage’ but that he (Terry) would look favourably on me if I made an offer as I was the son of one of his best customers; my dad bought all the wood for the signwriting business from Anderson’s. This I did; I made an offer which he accepted. I then had to find a way of getting the wood from Islington Green to Drayton Park, and thence cutting up into bundles of firewood. I recruited a bunch of younger boys from the estate who had bikes. I went round the houses finding pram wheels and axles and made a series of trailers so the boys could transport the wood (dunnage) from Anderson’s to Harvey’s. They were paid so much a load, with extra if they then chopped and bundled and business was great. I had enough wood to go out all week long on the Harvey’s lorry. Even at only 6d a bunch, I was earning twenty quid a week, as opposed to my dad who was a good signwriter and who was only earning a tenner. As winter turned to spring, I realised that I would need to find another income. It was still a year before I would be old enough to drive, so that idea had to be put on hold. I remembered that as a kid we used to go to Hampstead Heath, and would always buy an ice cream from a guy with a bike at Whitestone Pond. I made enquiries and discovered that the Ice Cream firm was Marine Ices based at Chalk Farm. I went to see the man Mr Marinello (Giuseppe to his friends) to ask if there was any possibility of a job selling ice cream, and he said that I was in luck because the old guy had died at the end of the season the previous summer, and that if I was fit and could ride a bike I could have the job. My test was to ride up Haverstock Hill to the top where his brother (Antonio) would be waiting, and then get back down to Chalk Farm in 15 minutes, I could have the job. No problem to me, as I’d cycled on that very bike (my Freddie Grubb) all the way to Saaaaafend with Griff Lewis the previous summer. I set off up the hill, saw Antonio and freewheeled all the way back down to Chalk Farm in just 12 minutes. I got the job. I started the following weekend which was Easter, so worked Friday to Monday selling ice cream to the Easter Revellers. However riding a lightweight racing bike up Haverstock Hill is one thing, riding a one gear tricycle with four eight gallon tubs of ice cream, plus four boxes of lollies with twenty four lollies in each is a different matter. I did OK but I’d run out of ‘gear’ by mid day, and had to cycle all the way to Chalk Farm to re stock and then back to Whitestone Pond. I have to say it was a very profitable weekend, but by the time the funfair closed on Monday evening, I was knackered. Anyway at least I’d earned a fair whack, and didn’t have to work again till the following Saturday. Then I had my best idea ever. I was passing the Post Office at Finsbury Park when I saw an advertisement for Premium Bonds. It was just at the time when multi number bonds were starting. Before then you could only buy them at £1 a pop. Now the government were getting greedy and trying to lure the population to pay for the future of the country by gambling; a scam popularised by Maggie Thatcher later on; I had just had my best few days ever, so I punted a fiver. Would you believe it, one of my numbers came up. The following Thursday (for they held the draws on that day) I won the top prize of One Hundred Grand, so I took a taxi to Mr Marinello in Chalk Farm to tell him what he could do with his bike. The moral of the story is that you can work as hard as you like, but you can’t beat luck! Ed: I wonder where his tongue is firmly placed? Nice one, Paul. Considering our lot in life we were fortunate, and even though the standard of accommodation in the Victorian tenement buildings wasn’t as high as those of the neighbouring estates of Laycock Mansions (Metropolitan Borough of Islington council flats) – built in 1926, or the Samuel Lewis Trust Buildings – constructed between 1910 and 1914, we were at least comfortable. Bearing in mind that when Liverpool Buildings were erected in 1883 by the Improved Industrial Dwellings Company, these model flats were a huge advancement in working class accommodation. With the exception of not being equipped with an actual bathtub, each flat was a self-contained unit complete with full town gas services; indoor toilet plumbing; sanitary refuse disposal; cooking range, and laundry facilities. Open fireplaces in each room; built-in cupboards; cold water sink, and a coal bunker were also incorporated. The immediate neighbourhood, too, was typical of the time and the estate of flats formed a tightly knit community where most people knew each other. Although as years went by, the true essence of neighbourliness became diluted. However, it was understood that children playing outside unsupervised were considered safe and if any child did encounter a difficulty or injury, he or she would be looked after by a sympathetic neighbour and eventually taken home, no questions asked. Spontaneous street parties were organised on special occasions and everyone contributed to them in one way, shape or form. The late 1940s, though, was still a time of acute austerity. As the country started to stand once again on its own feet, the general, and particular the working population was trying to make ends meet. Certain types of rationing remained in force and a succession of severe winters made life a misery as domestic burning coal was in short supply. One particularly bad winter meant that ‘keeping the home fires burning’ was an important issue. It was at a time of desperation and one of the only ways out of the situation was to scavenge. My father and his brother-in-law, Uncle Keith, rose to the challenge and decided to ‘raid’ the nearby Charrington’s coal yard. They were both veteran paratroopers, physically fit and mentally experienced in commando-style tactics. The plan was carried out under cover of darkness. Both men carried a canvas sack and scaled the gates at the entrance to the coal yard driveway on Liverpool Road. Once on Charrington’s property, they crept via shadows to the shed where the railway coal wagons were parked and picked up surplus lumps of coal. The lumps were carried away in the canvas sacks and, once again, the men scaled the gates before returning to the flats with their booty. In later years when again, it was beneficial to supplement the meagre coal stocks, Dad would find wooden blocks, soaked in creosote, that were discarded at the time the tram tracks were being removed at Highbury Corner. In the meantime as I was approaching school age, the neighbourhood and its inhabitants were becoming more and more familiar to me and I was learning the names of other tenants and people who lived in the street. Accompanying Mum on local errands meant going in and out of shops, mainly those in the Upper Street and St. Paul’s Road arcades. We went as far as the junction of St. Paul’s Road and Highbury Grove to shop at Ernest W. Noakes, a traditional butchers with an excellent reputation. Inside, the floors were strewn with sawdust and the fresh meat would be cut to order on the marble countertop. The walls were tiled and spotless and, at the front window, sides of beef and pork, and rabbits and fowl would be hanging on display above marble trays of various meats, sausages and offal. Mr. Noakes would be there dressed in his striped butcher’s apron ready to pass the time of day as he filled our order. On our way home as we walked along Highbury Station Road from Highbury Corner we often stopped to chat with Mrs. Cornish who lived in the old railway workers’ cottages opposite Laycock Secondary Boys School. I was always intrigued with these three cottages as they seemed to me so ominous with their dark Victorian interior. I could only see a little past Mrs. Cornish's portly body standing in the doorway, but there were massive drapes across the door openings and gilt framed photographs hanging on the hall walls. In retrospect I assume Mrs. Cornish was a widow of a railway employee and lived in a company house. She would be seen standing at her open door ready to make conversation to any likely person wanting to share a yarn or two. I was now beginning to know my immediate neighbours. Opposite us was the Jacobs family who lived a reclusive lifestyle and were rarely seen. Below them was Mrs. Greenfield, whose daughter and new husband lived opposite and directly below us. Underneath Mrs. Greenfield was Mr. and Mrs. Hawkins and their son, Patrick. Beneath them were the Stantons, one of the roughest families on the estate. On the ground floor lived two elderly spinster sisters. They remained completely in the past and shunned electricity, preferring to light their flat with gaslight. In general, the tenancies didn’t change often and at the time the flats were demolished in the 1970s there were many long term tenants still in residence. Samuel Lewis Trust Dwellings, Liverpool Road. circa 1910. Photo courtesy of Southern Housing Group Limited. Geographically, Liverpool Road was one of three main thoroughfares that radiated northwards from the Angel, the other two being Upper Street and Lower Road which in turn, became Essex Road. Our road was once a series of terraces and dairy farms before the population explosion of the early nineteenth century radically changed matters. In 1801 the population count was 65,721. In 1841 that had risen to 162,717 and by 1881 it was 369,850. Houses had to be built and utilities installed. (incidentally, the count in 2011 was 206,125, a big drop) We lived in Samuel Lewis Trust Dwellings, built in 1910 on the site of the sheds of what was probably Laycock Dairy Farm. Islington was then the dairy capital of London because the rich soil produced the best grasses on which the cattle fed. 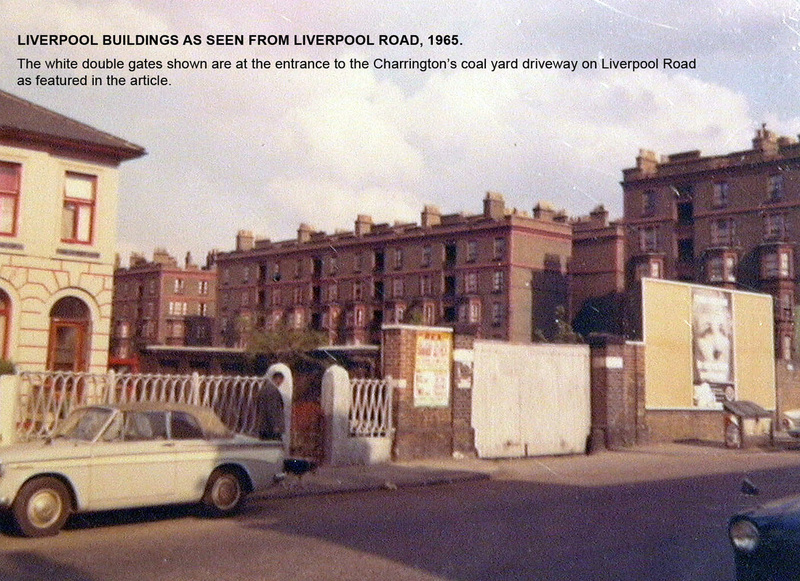 We lived at 57B Samuel Lewis Trust Dwellings on the Liverpool Road. 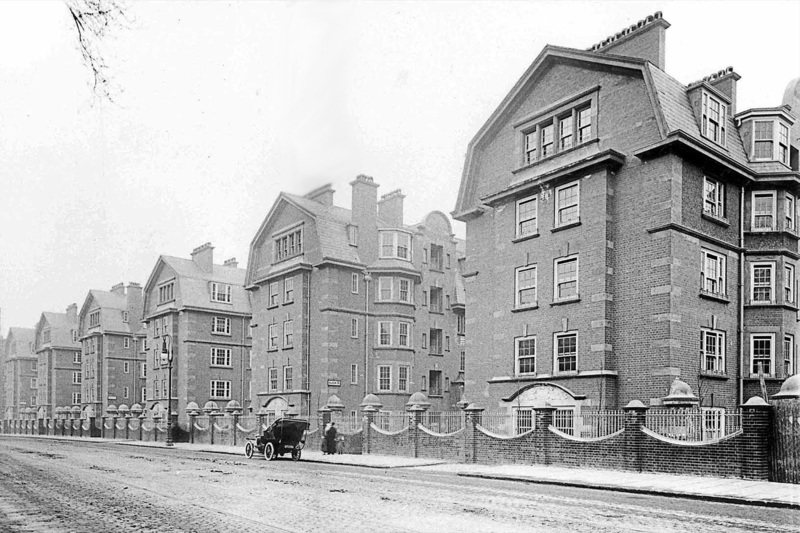 They were privately owned as opposed to council, as the philanthropist Samuel Lewis built the flats explicitly for the poor people of Islington. We sure fitted the bill. The flat had two bedrooms, a lounge, passage and a kitchen with a built-in bath which had a top that came down over it as a work surface. Finally we had an open balcony that looked down from our top floor, onto the main grounds. On one side of the balcony there was a larder with a coal bunker underneath and on the other side there was a toilet which being out in the open, was literally, brass-monkeys in winter. Being only two-bedroomed was a problem for us with five people, so we had a "put-u-up" in the front room. All the family including odd visitors, slept on it at various times. There were five main blocks on the estate and one small widows’ block, tucked on to the end of the grounds in a smaller space by Laycock Street. Each of the five blocks had three entrances and there were twenty flats accessed per entrance. So in total there were three hundred families plus the widows’. I would estimate that at least two thirds of the families had children of all ages and this made for great fun when I was growing up. I never knew loneliness. My Nan lived next door to us at number 58B. Hers was a one-bedroom flat and she lived there with her second husband, James Wilkins. My Nan's name was Sarah Ann Wilkins, nee Martin, but she was known as "Em". I found out later she adopted this name because she was given the same forenames as another of her sisters. Can you believe that? Two sisters with the exact same names. Nan being the younger, had to change. My brother John, older than me by nine years, told me he once asked our grandmother why her mother had done this and our Nan replied, "because she was mad". I don't know quite how to interpret that, but on the 1911 census it was stated that my great-grandmother, who in her married years lived in the cottages down Popham Street, had given birth to twenty children, ten of whom had died. I feel that this must go a long way to explaining her confusion. This was my world as I knew it. My mother returned to work as soon as was possible because we needed the money and my Nan looked after me from then on. I remember nothing of those years and I don’t know what that says about my Nan. She wasn’t a warm person and I can’t ever remember her cuddling me or affectionately ruffling my hair. God forbid she should tell me that she loved me. That word definitely did not exist in her dictionary or come to that, any other member of my families’ dictionaries. Possibly it was the result of living such hard lives that people of that era found it difficult to show any love or affection. I did not know anything else and I never gave it a thought, anyway. Hindsight, eh? A gang of kids from Lewis Buildings playing chaser in Sutton Dwellings, which ran from Upper Street to College Cross, discovered that in the blocks there was a door that when opened had a trap door leading down to a tunnel. We decided to return another day with torches. The tunnels were connected to each block; cabling all along the walls, and the smell very musty. But us intrepid kids didn’t give a toss for health and safety. Bit scared down there cos we couldn’t get next block's trap door open. Could you get back still? We did and had great fun. Happy days. It was the spring of 1950. Mum & Dad on one of their many camping trips, this time I believe either on their way to or coming back from Dawlish Warren one of their favourite destinations. The photo depicts yours truly as a three year old ‘toe head’ with Dad (Fred), Mum (Alice) and my uncle Alan (Mum’s second youngest brother) on the road. Photo taken by late uncle Don who married Mum’s Sister Clare; they often travelled together on holidays after the war. My Dad drove a ‘Panther’ combination, 600cc single-cylinder engine. He built the sidecar and the trailer in the back-yard at 22 Oseney Crescent in Kentish Town where I lived after being born in 1947 at the Royal Northern Hospital, Holloway Road. A year after this picture was taken my first of three brothers (Glyn, who also went through BBS) was born. Dad’s signature flying suit, army beret and goggles speak for themselves; he cut quite the picture of an ex-army Brit! Uncle Alan rode pillion and Mum and I sat in the sidecar. The ‘Panther’ was a drop-dead ‘never fail’ machine that would run with incredible reliability, built for power and durability not for speed albeit Dad said it would do well at 70MPH on the A1 coming home. Dad bought a ‘newer’ bike later after Brother Glyn was born. With ignition advance and all-important compression release at the handlebar controls Dad (not a big man, maybe 145 pounds) could kick it over and start it, no problem It was a thump-de-thump motor, and would idle at about 3-400 RPM. Petrol was ‘pricey’ back in the day. Dad’s ‘biking’ days inspired my first motor cycle purchase; an ‘Excelsior V-Twin’ 250cc 2-cycle engine that I actually rode up to Norfolk when me, Pete Langridge, Tom Caylor and Pete Tuhill did the classic Norfolk Broads boat trip in 1963. I’m still in touch with Langridge (my first friend from 1B in Eden Grove.). Lost touch with Pete Tuhill (no idea) but heard (from Pete L.) that Tom Caylor lives and works as an architect somewhere in the Plymouth area. My motor cycle days took me from the ‘Excelsior’ to a ’Triumph Bonneville” and then here (in the US) to a ‘Harley Davidson” albeit at my age it’s probably time to give it up. Gents, this a just a ‘snippet’ of my personal story, there must be many more that my colleagues and BBS friends might wish to recount and share. My own life is rich with these memories; I’m truly blessed with these wonderful recollections of childhood when life was so much simpler. Dad left me at 90 years old in 2000 but I can assure you his ‘Panther’ is still cranking away up in Heaven. Mum is doing very well, hail and hearty, and coming up on 93 years young this year. May Bless her, and all y’all GOBBs . . . .
Apropos Barry's insights I indeed came into this life in Oseney Crescent (actually born in the Royal Northern Hospital (Holloway Road, Islington) where my dad was on staff in the engineering department, circa 1947. I attended nursery school in Cliff Villas and went on to Hungerford Road Primary School as Barry aptly identifies as being in the Borough of Islington (York Way I believe was was the borough boundary). At that time Mum & Dad lived in Cliff Road just the other side of York Way. I didn't play cricket for the school so probably never encountered the Laycock team. My memories of Hungerford Road are dreaming bout getting into the woodworking shop above the accessory building with the older boys, competing in 'Dinky' toy races on the paved down-slope at the rear-yard area, and sneaking out the back door to the Goodinge Road sweet shop across the street after school on the way home. It was a bit of a 'rough' street and dad wouldn't allow me to go there. My headmaster, one Mr. Prattern was an important influence on my young life; asked me to read scripture at morning assembly, and was a devotee of American Gospel music, often played old acetate 78rpm records of Paul Robson ('Water Boy' comes to mind). It was the beginning of my appreciation of music. Mr. Prattern was the reason for my being enrolled at Barnsbury following the basic disaster of the 11+ exam. My first year teacher there (Ms. Hornsby) encouraged and developed my affinity for and devotion to language and writing, maths and science; an incredible lady (all of five foot nothing) who once swung a fire bucket (swiped from the hallway) half filled with water over her head 360 degrees to demonstrate centrifugal force. Amazing! When my first younger brother (Glyn, who also went through Barnsbury) was born and then later two more brothers came into the world Mum and Dad moved to Stock Orchard Crescent just off the Cally in Islington where obviously they needed more rooms. It was from there I walked to Eden Grove every day (past Pentonville Prison) and later to the Camden Road facility. 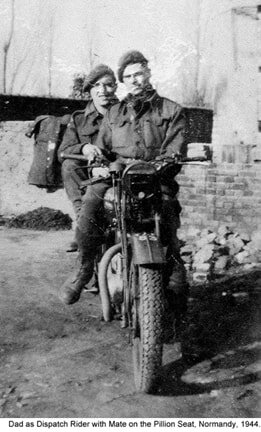 My late father, father-in-law and uncle cut their mobility teeth on motor cycles before and during WWII. 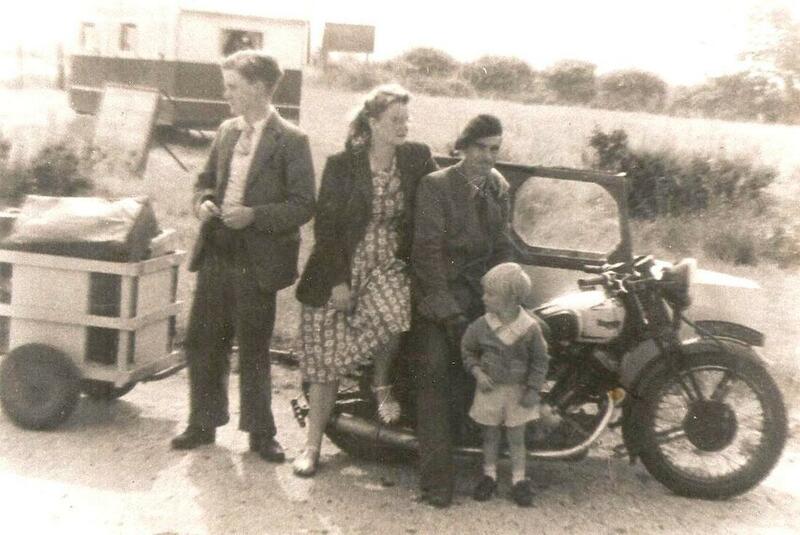 The attached images show my father as a dispatch rider (taken in Normandy just after D Day); father-in-law when courting mother-in-law sometime in the late 1920s (I think the m/c is an AJS model), and Uncle Keith with his favourite Triumph (postwar). Dad always described his pre-war m/c outings as adventures: no helmet - just turn one's flat cap backwards - and flying goggles. Reminiscent of the opening scenes in the movie "Lawrence of Arabia." After WWII and demobilization, Dad's mode of transportation was a JAP powered Morgan three-wheeler, which proved unreliable and he exchanged it for a beat up Triumph Bonneville motorcycle, which you could hear before you could see it. But he rode it in all weathers on a significant commute from Highbury to Denham, Bucks. The family eventually graduated to four wheels with a Morris 8, and later a Triumph model. One day there was a knock on our front door. Outside was a neighbour's kid, Clarissa Matton who excited said that our car was on fire. Dad rushed down the five stories of the flats, and I ran to the front window overlooking the street, expecting to see a massive fire. However, it was just a smouldering electrical cable, and Dad extinguished it with one of those hand pump 'Pyrene' devices. Before Dad passed away, he was quite adept in piloting his mobility scooter around the twisting turnings of the village of Potton, Beds. In a letter to me, he wrote: " … It just reminds me of my old motor cycling days. …" Evidently his pre-war m/c memories were crystal clear. My Mum and Dad forced me to leave London at the end of 1968. My father was born in Malta as a British citizen and served in the Royal Air Force during World War Two. My Mum was Italian but became a British citizen in 1946. I was born in London in 1949. I passed my G.C.E. A levels in 1967 and went to work at a research laboratory hoping to get a scholarship to Cambridge, but meanwhile I met someone who asked me to join IBM. Then my Mum and Dad stepped in. Despite the passing years my soul is British and they were my greatest years. I'm longing to see you guys especially Tam; I really appreciate his friendship. I have so much to talk about.